John Fitch, one of the leading sportscar racers of the 1950s, who raced for the works Mercedes-Benz and Chevrolet teams, died yesterday at the age of 95. After serving in the US Army Air Corps in the Second World War, which he ended as a prisoner of war, Fitch started racing regularly driving an MG TC in 1948. 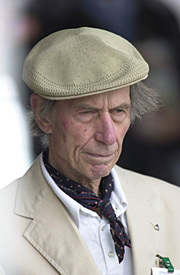 He raced a Jaguar XK120 at the newly-opened Sebring circuit in 1950 and went on to become the inaugural Sports Car Club of America national champion a year later. During 1951, he raced a variety of machinery, including the Cunningham C2 after gaining the patronage of the wealthy Briggs Cunningham, who recognised that Fitch was one of the most accomplished road racers in the United States. He made the first of six appearances in the Le Mans 24 Hours that year, eventually being classified 18th, and ran strongly in 1952 before his Cunningham C4R's engine failed thanks to contaminated fuel. He also made his first appearance in factory Mercedes machinery at the end of the year driving a 300SL in the Carrera Panamericana after impressing with his pace in testing at the Nurburgring earlier that year. In 1953, he won the Sebring 12 Hours, sharing the Chrysler-engined Cunningham C4R with Phil Walters, and made the first of two starts in world championship grands prix, failing to finish in an HWM-Alta at Monza. He also finished third and won his class at Le Mans, sharing a C5R with Walters. In his final year with Mercedes, 1955, he starred on the Mille Miglia. While Stirling Moss took the plaudits for his victory, Fitch drove superbly in a production class 300 SL, finishing fifth overall and winning the GT class - a performance he chose as his 'Race of My Life' in AUTOSPORT. 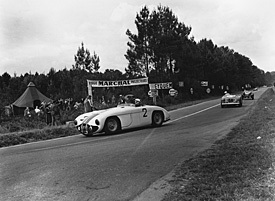 But his 1955 season was also tinged with tragedy, as he was sharing the Mercedes in which team-mate Pierre Levegh crashed fatally at Le Mans, also killing over 80 spectators. He made three more racing appearances that season, winning the RAC Tourist Trophy with Moss on the epic Dundrod circuit, finishing fourth in the Targa Florio and taking ninth in his final world championship grand prix at Monza driving a Maserati 250F. With Mercedes then pulling out of racing, Fitch joined up with the nascent Chevrolet Corvette racing programme in a combined driving/management role, leading the team to class success at Sebring in 1956. The rest of his racing career was spent largely in the United States, although he did appear in Europe as late as 1960, finishing eighth and taking a famous class victory with Bob Grossman in the Corvette at Le Mans. His final race as a professional driver was at Sebring in 1966, sharing a Porsche 904 with Briggs Cunningham. Fitch remained involved in the industry, pioneering a number of live-saving safety improvements. This includes the famous Fitch Barrier, a water or sand-filled container used on American highways to absorb crash impacts.